The strength of our professionals. When addressing complex financial issues, we believe strategies developed collaboratively by a team of experts are stronger than those developed in isolation. So our Private Wealth Advisors consult with each other to develop an approach to your portfolio that’s rock-solid. 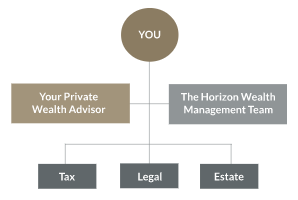 *Tax and legal services are not offered by Horizon Wealth Management, LPL Financial or affiliated advisors.